The potential of radio-tag signals from fixed-position antennas systems to provide more precise information on tag location and movement has not been explored in great detail in an ecological setting. In their Open Access article ‘Novel, continuous monitoring of fine-scale movement using fixed-position radiotelemetry arrays and random forest location fingerprinting‘ Harbicht et al. present a new telemetric tool for accurately estimating the location of tagged individuals from received signal strength values. The new methods applied in this study can also be expanded to include multiple axes (x, y, z) and multiple environments (aquatic and terrestrial) for remotely monitoring wildlife movement. 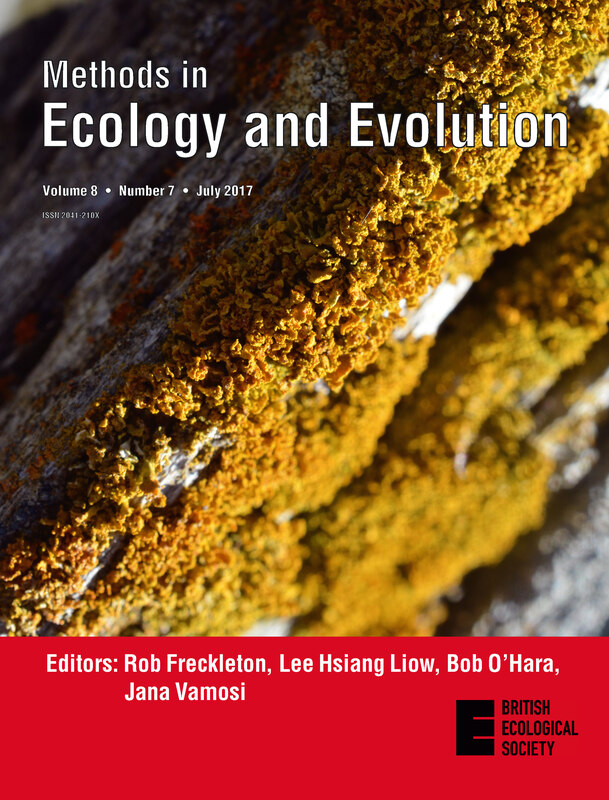 Our July issue also features freely available articles on Biodiversity, Genetics, Movement Ecology and more. This month’s cover image shows the bare-bottomed sunburst lichen (Xanthomendoza fulva (Hoffm.) Søchting, Kärnefelt & S.Y. Kondr.) growing in a tree trunk in a forest located in Siskiyou County along the border between Oregon and California, USA. It can grow up to 1 cm or may coalesce over large areas forming rosettes or colonies of small ascending lobes, like those in the image. This species can be found in several boreal and temperate regions of the world, both in semi-open and shaded habitats growing over bark, wood or rocks. In the related article, Tracking global change using lichen diversity: towards a global-scale ecological indicator, Matos et al. design a novel framework to incorporate surrogates of lichen species richness, shifts in species composition and metrics of functional diversity collected by different sampling methodologies. Lichens, such as the species depicted in the image, have been used as ecological indicators of the effects of the major drivers of global change since the beginning of the industrial revolution to the present. The framework developed will enable future cross-continental analysis of lichen biodiversity change from North America and Europe, enabling a more thoroughly comprehension of biodiversity response to global change. This entry was posted in Journal updates and tagged biodiversity, ecology, Ecosystem Health, evolution, Food webs, genetics, Global Pollen Project, Lichen, movement ecology, Plant Crosses, Pollination, Radiotelemetry by Chris Grieves. Bookmark the permalink.